Chibi is a style of drawing used in Japanese comics and cartoons. Chibi characters are known for simplifying parts of the body such as fingers or feet. Although Chibi characters are simpler versions of the human figure, it can be challenging to draw them. It isn't uncommon for beginning artists to struggle with mapping out a Chibi character's body and keep the drawing simple. If an artist understands the basic principles of figure drawing, they will be able to develop their own Chibi characters. Observe your reference picture of a Chibi character. You can find a reference picture by following the link in the resources section below. Study the areas which are calling cards to Chibi Anime. Make note of the lack of neck, details in hands, large eyes, small mouths and stubby legs. Sketch parts of the character's body. Don't worry about creating a finished picture; focus on becoming familiar with the structure and build of a Chibi character. 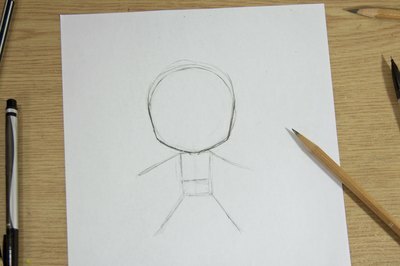 Practice drawing the simplified arms, legs and outline of the character's face. Work quickly, and do not erase any mistakes made. 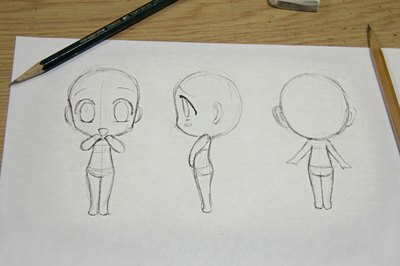 Practice drawing the outline of the Chibi character at different angles. Quickly sketch a back, side and front profile of the character's body. Focus on simplifying parts of the character wherever possible. Draw different facial expressions onto the outlines you create. Continue to practice until your feel ready to create your Chibi Anime. 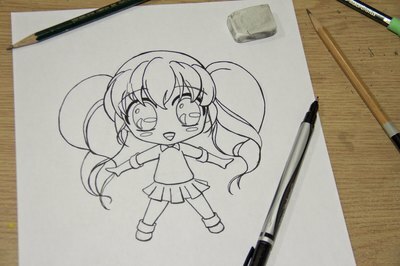 Sketch the rough draft of your Chibi character. Draw a circle to map out the character's head and extend a line from the bottom of the circle to create the spine. Create the torso and hips of your character by drawing two squares along your spine. Map the arms and legs of your character by drawing two lines extending from the torso and two lines extending from the hips. Check the proportions of the body, and make sure it's about equal size with the character's head. Keep the limps and body of the character compact. Draw the basic outline of your character's face. Create the basic shape of your character's head by following your circle to map the top of the skull. Draw the forehead and cheeks smooth; do not add any curves to the side of your character's face. Create the jawline of your character by drawing your outline inwards toward the neck, giving an angle to the face. Draw the neck of your Chibi character small in length and width. Pencil the outline of the character's body. Start at the base of the neck and follow your rough draft to create the body, arms and legs of your character. 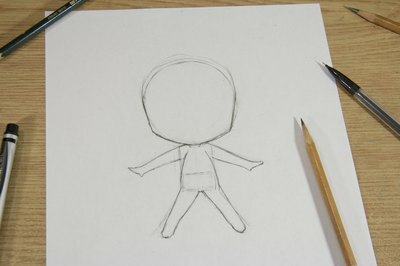 Keep the body of the Chibi character small, and draw the arms and legs in equal length to the body. Develop the hands of your character by using points to map the fingers and thumb. Do not draw the detailed shape of the hands; draw them small and simple. Draw feet onto your Chibi character by penciling the bottom of the feet as stumps. Add a small point to the front of the character's foot to map the toes. Erase the markings of your rough draft. Draw the basic outline of your character's clothes. Use the outline of the body to give the clothing a natural flow. Keep the details of the clothing simple. Only add designs and logos that will establish personality of your character. Avoid drawing folds into the character's clothing. Draw the basic outline of your character's hair. Draw the hair large, and allow the bangs of the hair to come halfway down your character's face. Draw the hair strands of your character thick, and avoid drawing inner strands of the hair. 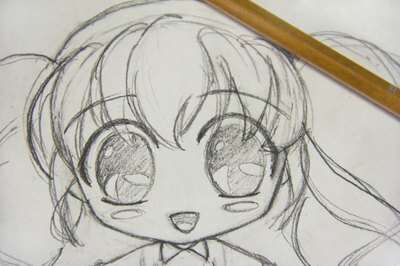 Sketch the facial details of your Chibi character starting with the eyes. Space the eyes far from each other, allowing each one to almost touch the sides of the character's face. Draw the pupils of the eyes large and round for a cute look. Shade the pupils of the eyes lightly with your pencil. Sketch the shape of the mouth small, placing it at the bottom of the character's face. Do not draw a nose onto your character. Draw the eyebrows large and thick, and curve them to capture the expression you desire. Review your drawing, and erase any smudges or extra pencil markings. Correct any mistakes you find, and ink your drawing by tracing over your lines with a black pen. Erase all your pencil markings for a clean look. Add shading to your drawing using a cross-hatching method with your pen to complete the picture. Practice drawing Chibi characters using different styles. This will help develop your ability to draw. Draw Anime daily. This will increase the quality of your drawings. Look at techniques other artists use to draw Chibi characters. This will give you ideas for your own work. Use a reference picture when first drawing Chibi Anime. It is difficult drawing this style from memory.